BITTER SWEET: That was the feeling after the screening of the nationally-released film Red, produced by local movie-man Norman Dreyfuss. Bitter because the film is a meditative and character-driven revenge film about a man (Brian Cox) whose beloved dog, Red, is shot and killed by troubled teens. Sweet thanks to the plush décor and chocolate-covered catering of Penn Quarter hotspot, the chocolate lounge Co Co. Sala. 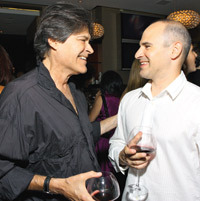 THE GUESTS: Dreyfuss’ friends and family members – including son Brian, who brought the script to his attention – mingled with Red author Jack Ketchum, co-producer John Cecchi, Miss DC 2008 Kate Marie Grinold, and Co Co. Sala owners Bharet Malhotra and Nisha Sidhu.